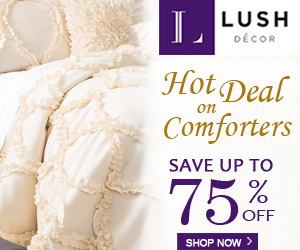 Buy the latest selections of bedding coverlets and coverlet sets online if you want a coordinated look to your bedroom. Coverlet sets are not all equal and often contain different components but in general you’ll get a coverlet (bedspread in some parts of the world), one or two pairs of pillow shams (decorative pillow cases) in different sizes and sometimes even a couple of pillows (cushions) in different sizes. Here’s a buying guide to coverlet sets to help you get exactly what you need. These sizes are standard but there can be a slight difference. Ideally, your coverlet should hang nearly to the floor on both sides and at the end of your bed. Again, these sizes are pretty standard. Be sure to check what each coverlet set contains if you don’t want to find that you don’t have the pillows to fit the pillow shams included. For the Coverlet 100% Microfiber is usual. For the Shams 100% Microfiber is usual for the front, often with brushed polyester reverse. Fillings are normally 150 or 200 g/m2 cotton or 50% cotton, 50% polyester. Some coverlet sets are marked as hypoallergenic so look out for these if you need to but check the fabric listing as well for your particular allergen. Make sure that the fabric is machine washable if you don’t want to incur heavy dry cleaning bills. You can buy just about any colour and pattern under the sun. Sometimes the coverlet is quilted sometimes it is reversible with a plain colour on one side and a pattern on the other. Usually the pillow shams would have the same options as the coverlet. Extra pillows may have individual patterns but the colour schemes will be the same as for the coverlet and shams. Check out the lovely, varied selection of coverlet sets here at Coverlet Sets. Copyright © 2019 Coverlet Sets.